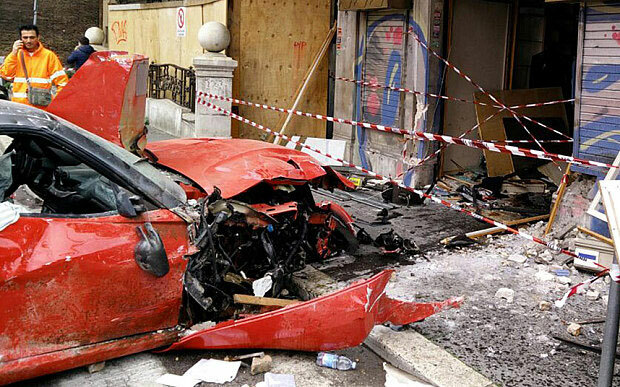 According to Corriere della Sera, the valet driver named Roberto Cinti, aged 38, had mistakenly put his foot on the accelerator instead of the brakes, causing the 670 horsepower car to plough straight through the shop premises. Although nobody was injured, the resulting crash inflicted major damage to both the shop as well as the car which ultimately had to be written off. Known as the fastest road car from Ferrari, the Ferrari 599 GTO costing a whopping £300,000 ($444,667) sports a 6.0-liter, V12 engine paired with a six-speed automated manual transmission. It can go from 0 to 60 mph in just 3.3 seconds and reach a top speed of over 208 mph. A total of 599 examples of the car have been made and only three car models from Ferrari received the highly coveted GTO status.